Skyscraper Defense Inc. understands the importance of continuing education. Whether you are a firefighter, a first responder, an architect, a structural engineer, a high-rise building code-writer, or a government official responsible for the safety and security of people who live and work in tall buildings, there is a wealth of information in the following books. May the wisdom you gain save countless lives. by Vincent Dunn, Deputy Chief (Ret. ), Fire Department of New York Learn how to protect yourself from collapse by understanding why it occurs and the signs that lead to it. Dunn reviews general building design and construction methods, along with the types of collapses that may occur. He also documents hazards that occur with master stream operations and buildings under construction. 548 Pages. 30% OFF SALE! 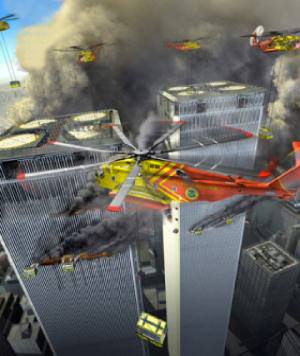 SkyscraperMan™ is the true story of Dan Goodwin, a renowned American rock climber who scaled many of the world’s tallest buildings, including the Sears Tower and the World Trade Center, dressed as Spider-Man. On the surface, his actions may seem to be that of a publicity seeking stuntman; however, nothing could be further from the truth. In 1980, after witnessing the MGM Grand Hotel fire in Las Vegas, where scores of guests were left on their balconies to die a horrific death, ‘Spider-Dan’ set out to warn the world of shortcomings in high-rise firefighting and rescue. He soon discovers however that he has stumbled upon a secret so well guarded that some are willing to stop at nothing to keep the world from finding out, even it means committing murder. Despite the odds he persists, even developing techniques and equipment that, had they been available in the World Trade Center, 9/11 could have had a different ending. Underlying it all is Dan Goodwin’s relentless pursuit of the very comprehensive Skyscraper Defense Act, the first draft of which he wrote in the aftermath to the 1993 World Trade Center bombing. This non-fiction thriller will surprise, inspire, and educate you. This is a “how to” book written by a “know how” person for anyone who practices firefighting strategy. Deputy Chief Vincent Dunn is passing on to the next generation of firefighters the lessons he learned from his years of firefighting experience. He describes firefighting strategies for the most common types of fire scenarios and identifies specific firefighting problems presented to an incident commander, by occupancy and construction type. More importantly, he explains firefighting solutions and offers firefighting plans, standard procedures, action plans, ideas, guidelines, explanations, key steps, and systems of firefighting procedures. This book is not about tactics. 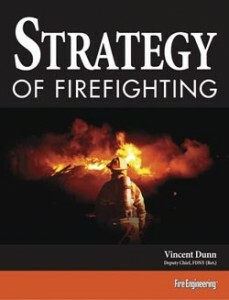 It’s about strategy – plans of firefighting and logical ways to solve problems at fires. A busy fire officer handles numerous tasks: administration, budgets, political interaction, medical response, fire prevention, inspections, etc. This book brings the active fire officer back to his job’s focus: Fighting fires and responding to emergencies.